Because the moon is tidally locked, meaning the same side always faces Earth, it was not until 1959 that the farside was first imaged by the Soviet Luna 3 spacecraft. And what a surprise — unlike the widespread maria on the nearside, basaltic volcanism was restricted to a relatively few, smaller regions on the farside, and the battered highlands crust dominated — a different world from what we saw from Earth. The cause of the farside/nearside asymmetry is an interesting scientific question. Past studies have shown that the crust on the farside is thicker, likely making it more difficult for magmas to erupt on the surface, limiting the amount of farside mare basalts. 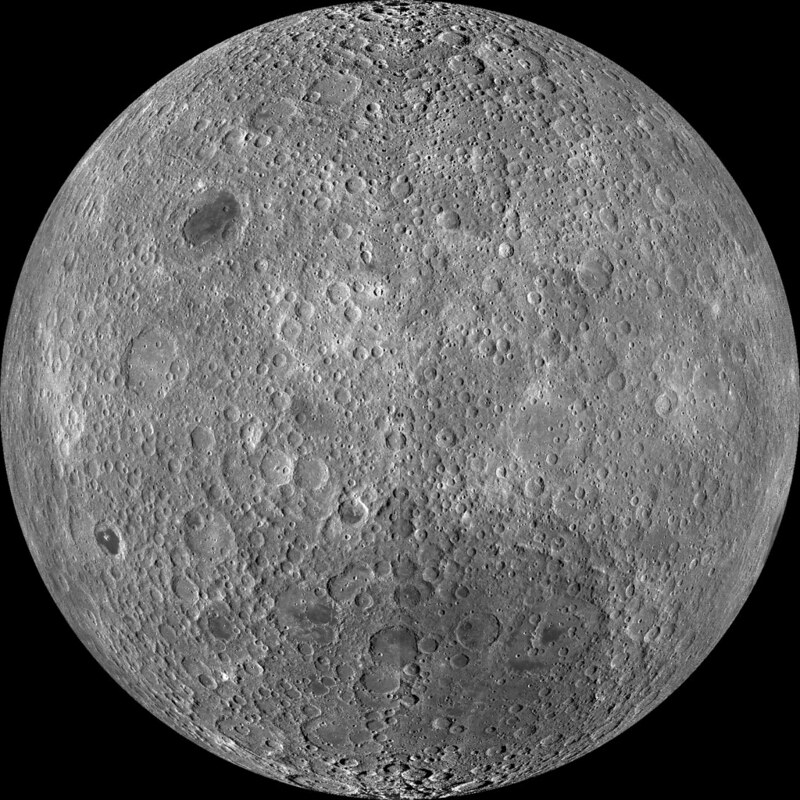 The Clementine mission obtained beautiful mosaics with the sun high in the sky (low phase angles), but did not have the opportunity to observe the farside at sun angles favorable for seeing surface topography. This WAC mosaic provides the most complete look at the morphology of the farside to date. The Lunar Reconnaissance Orbiter Camera (LROC) Wide Angle Camera (WAC) is a push-frame camera that captures seven color bands (321, 360, 415, 566, 604, 643, and 689 nm) with a 57-km swath (105-km swath in monochrome mode) from a 50 km orbit. One of the primary objectives of LROC is to provide a global 100 m/pixel monochrome (643 nm) base map with incidence angles between 55°-70° at the equator, lighting that is favorable for morphological interpretations. Each month, the WAC provides nearly complete coverage of the Moon under unique lighting. As a bonus, the orbit-to-orbit image overlap provides stereo coverage. Reducing all these stereo images into a global topographic map is a big job, led by LROC Team Members from the German Aerospace Center (Deutsches Zentrum für Luft- und Raumfahrt; DLR). This global mosaic is comprised of more than 15,000 WAC images acquired between November 2009 and February 2011. The LROC WAC orthographic projection is centered at 180° longitude, 0° latitude. As the mission progresses, and knowledge of the lunar photometric function increases, new mosaics will be released, according to NASA. Posted in Artwork, Big Picture, Photography | tagged astronomy, black & white, lunar, moon, NASA, science, space. The permalink.